Amid a below-average snow year and with an influx of visitors expected for Presidents Day weekend, the U.S. Forest Service Lake Tahoe Basin Management Unit is asking snowmobile riders to stick within permitted areas that have adequate snow coverage. Snowmobile operators should avoid bare dirt and patchy snow, the Lake Tahoe Basin Management Unit (LTBMU) warned. 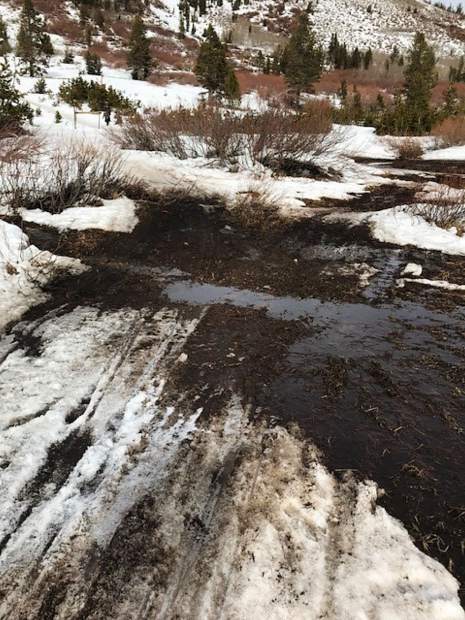 Operating snowmobiles on too little snow creates ruts in the soil and crushes vegetation. Snowmobile riders also should not ride across streams or over small trees or brush. Causing resource damage can result in a citation punishable by a fine of $5000 or more and/or six months in jail, according to LTBMU. The Forest Service will continue to monitor areas throughout the Lake Tahoe Basin for compliance. Information on areas where snowmobiles are allowed is available at http://www.fs.usda.gov/goto/ltbmu/Snowmobiling or at the forest supervisor’s office at 35 College Drive in South Lake Tahoe, 530-543-2600.